Ultiworld’s reporting on the Mixed Division of the 2018 Elite-Select Challenge is presented by Universe Point cleats. All opinions are those of the authors. Please support the brands that make Ultiworld possible and shop at Universe Point! Look, I’m as surprised as you are. A team whose offense was referred to, semi-jokingly, as “tragically effective” is on the verge of being just plain effective. There’s a lot to be said about getting reps as a unit in tournament situations. 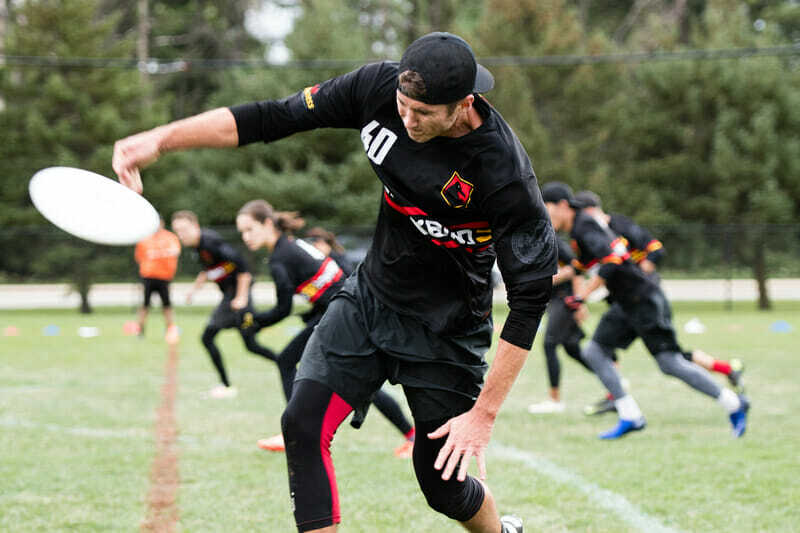 No Touching!, by the time Regionals rolls around, will have played at the Pro-Elite Challenge, the Elite-Select Challenge, and the Pro Championships, along with all the Masters ultimate at Nationals and Worlds this year. Coupled with minimal turnover and a standout talent in Sam Valesano, No Touching! have the right combination in place for continued success. A good performance this weekend puts them in the driver’s seat for another North Central bid to Nationals. Their throws are disciplined, they play within themselves, and they don’t try to do too much. It’s a recipe for success. This seems familiar. One year later, Blackbird again managed to put together a complete performance and shift their bid fortunes. Last year, it was at the Pro Championships, spurred by a run to the finals against Mixtape. This year, it was taking down Fort Collins shame. and Madison NOISE in their first two games today. While Blackbird’s goal is still to peak at Regionals, they proved they knew how to dial in and get wins. Mac Taylor remains a world-beating talent, and he was relied upon to a much greater degree today than in previous tournaments. As Blackbird continues to tinker with their new roster and ramps up closer to their final form, expect these closer wins to stretch out and prove they know what it takes to make it happen at Nationals. Bucket could throw the order in the Southeast region out of whack. They play very aggressive person defense, forcing teams into uncomfortable situations and generating a lot of turns. Michael Arenson and Emily Karoblis were defensive disruptors in their game against Boston League of Shadows, forcing tough, high-stall throws from the Boston squad and playing with a fire that few teams can match. With Durham Toro coming back to earth a bit this weekend, the time is right for Bucket to focus on fine-tuning at Sectionals to take down their regional rivals. Their 5th place semifinal matchup against Toro Sunday will be a preview of coming attractions. This is the Polar Bears we all expected to see last year. Still as athletic as ever, their defense challenged every throw from Durham Toro and San Francisco Mischief en route to winning Pool D on point differential. When their side stack isolation pull play is clicking, particularly with Ryan Takayama burning defenders deep, the offense is tough to stop. With a D-line offense that can grind or fast break, Polar Bears have proven they belong in the Nationals conversation again. Along with Blackbird, Polar Bears showed today that we write off the Southwest mixed region at our peril. Lochsa is playing a well-disciplined, organized vertical stack offense, and their defense can get out and run on a turn. However, they have also shown that they can’t quite recognize adjustments other elite teams make. They survived on double-game point over an improving Cincinnati Steamboat and edged past CLX with a two-point win, but couldn’t get by Love Tractor. In Jack Kingsley, they have a player who can make things happen on the turn, with strong hucks and good aerial ability to challenge any defender. But the pieces didn’t quite add up on Saturday. They can still make a run at Seattle Mixtape or Seattle BFG for that second bid to Nationals, but they didn’t show they could make the leap. Love Tractor performed about as we expected they would on Saturday. While the games themselves were close, including a double game point win over Iowa Chad Larson Experience, Love Tractor knew what they needed to do to win when it mattered. Often, that meant relying on Jack McShane to take over games. In the tighter games, though, he was not quite as sharp as we expected. If he is misfiring, that is a problem for Love Tractor. Lochsa stayed in the game as long as they did because McShane wasn’t as dominant as he is capable of being. They need him to be transcendent instead of merely great to move further up. Is he capable? Sure. We just haven’t seen it yet. Much like Denver Love Tractor, Toro played to expectations. They are heavily reliant on the deep space, with Christine Bookhout and Michael Pannone leading the charge to put up points quickly. If that gets slowed down and the offense is forced to play more laterally, Toro is susceptible to handler pressure. Polar Bears had success forcing Toro into risky inside breaks, and while Toro was able to hit those throws regularly, it pulled them out of rhythm. They are still the team to beat in the Southeast, but their inconsistency on offense today keeps them from moving up and being truly competitive at an elite level. Mischief remains a deceptive team. They were blown off the field by Polar Bears in their first game of the day, failing to hit anything deep. Mischief followed that up with a win over an athletic Durham Toro squad. Which Mischief is the right one? It’s tough to say. On paper, they have the pieces to be a dominant team. Yet something isn’t translating onto the field. Perhaps some of those pieces are in the wrong place. VY Chow still gets open in isolation like a player 15 years younger, and that first offensive look is miles better than what we saw at the Pro-Elite Challenge. The team improved throughout the day, and perhaps just needed that wakeup call from Polar Bears. But slow starts like today will not be forgiven at Regionals. Mischief still have the potential. They need to act on it. Steamboat has improved over the course of the year. From a rough Pro-Elite Challenge to a more consistent US Open, Steamboat have re-established themselves as the class of the Great Lakes. That still isn’t turning into wins. As they get more players back into the fold who have been missing due to injury, Steamboat will find themselves back in contention, but their early struggles still left the door open for the rest of the region. The target on their backs will be as big as ever. Brittany Winner and Daniel Khoe have their work cut out for themselves to keep the Steamboat Nationals streak alive, but I wouldn’t bet against them just yet. NOISE was as inconsistent as ever today. They should have run away with the game against Mesteño, but instead eked out a 13-11 win after dropping behind 9-11. They led shame. 3-0 to start, gave it all back, and then has to battle back for a 12-11 victory. Sure, they went 2-1 today, but the way they let games get away from them is concerning. Dayu Liu and Kayla Patterson can only do so much on offense. The drops and mental mistakes up and down the roster are tough to reconcile with the talent they have. With Minneapolis No Touching! playing as well as they are, NOISE have an uphill battle to get back to Nationals. League of Shadows have fallen back to earth this weekend. After peaking in the wake of their Boston Invite performance, facing off against other regions showed the relative lack of experience from the Boston squad. It seemed too easy to slow down the offense, and they played such a risky style that consistent teams can capitalize on the variance. This looks like a team that will go as far as their best player can carry them. If Tyler Chan isn’t clicking, neither is his team. Today did not go as expected for the Pro-Elite silver medalist. When shame. found space to cut deep into, Nick Snuzska could make that happen. But he wasn’t enough to shake the sense that the team does not travel particularly well. They can play well when they need to, but it looked like the teams that scouted well, particularly Blackbird, exposed the lack of offensive variation in shame.’s play. CLX didn’t play poorly, per se, but for a team who had won their previous two tournaments, coming up short in pool play against Love Tractor and Lochsa does not help their case. Defensively, their zone could generate turns early, but their offense wasn’t precise enough to capitalize. Once their opponents identified how to break them, CLX did not seem to have a plan B. The road back to Nationals seems to be a long one for the former powerhouse team, and it’s tough to see any progress being made this year. All three teams had moments of brilliance, but too often, they weren’t enough to seal wins. Alloy came the closest, giving Boston League of Shadows a scare in the first round, but beyond that game and Mesteño pushing Madison NOISE to the brink before losing 13-11, there wasn’t much in any of their performances to think they can challenge for a Nationals berth. A tough Saturday overall. Comments on "Elite-Select Challenge 2018: Saturday Stock Market (Mixed)"